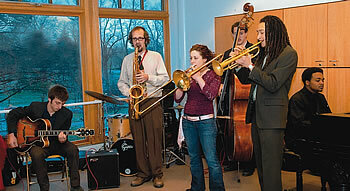 Stewart and Donna Kohl commit $5 million for new jazz studies facility. Performing for the Kohls in November was the Oberlin Jazz Septet, one of the student ensembles that will benefit from the new space. The December holidays arrived a month early at Oberlin, or so it seemed, given the festive air across campus and particularly in the Conservatory of Music. It was late November when President Nancy S. Dye announced Oberlin’s acceptance of a $5 million commitment earmarked for the construction of a new, much-needed facility for the Jazz Studies Program. The gift, which comes from Cleveland businessman Stewart Kohl ’77 and his wife, Donna, is believed to be the largest donation ever made specifically for the support of jazz education in the United States. Preliminary plans call for the facility to be connected to the south wing of the Conservatory, extending east from Robertson Hall, where a parking lot now sits. Student rehearsal space will be a most welcome part of the project, finally allowing jazz students to move out of their cramped practice rooms in the basement of Hales Gymnasium. Faculty studios, plus a library and a music laboratory for arranging and editing, are also being considered. The Kohls’ gift is expected to fund about half of the total construction costs, says Dye. 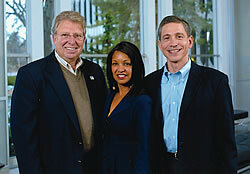 Mel Litoff, Donna Kohl, and Stewart Kohl (l to r) visited campus in November for the announcement of the Kohls’ gift. A more personal inspiration for the gift comes from the Kohls’ longtime friendship with jazz vocalist Phyllis Weisbart Litoff, in whose memory the building will be named. Phyllis and her husband, Mel Litoff, were owners of the renowned Sweet Basil Jazz Club in Greenwich Village and founders of the Greenwich Village Jazz Festival. They later became the artistic directors and producers of the Belleayre Music Festival in the Catskill Mountains of New York. Phyllis died of brain cancer in 2002, and the Kohls were moved to search for a way to honor her memory. During a visit to campus in early December, the Kohls and Mel Litoff were the guests of honor at performances by the Oberlin Jazz Ensemble and Jazz Septet. Litoff was particularly touched by the chance to meet student jazz musician Theo Croker ’07, whose grandfather, Doc Cheatham, was a much-loved trumpeter and bandleader who starred at Sweet Basil’s world-famous Sunday Jazz Brunch for more than 10 years. 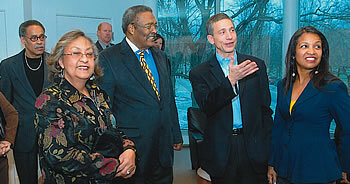 Wendell Logan, chair of the Jazz Studies Program, and his wife, Bettye Logan, are greeted by the Kohls. The Kohls, meanwhile, spoke passionately about their dedication to Oberlin and their hope of inspiring other alumni to follow their lead. Stewart, along with his business partner, Bela Szigethy ’77, are the primary backers of Oberlin’s Business Scholars Pro-gram, a popular, multi-location winter-term program that introduces students to the fields of finance and consulting. He and Donna also provided a gift of a neuroscience teaching laboratory several years ago in honor of Stewart’s parents.